Sheet Metal Workers Local 22 provides skilled craftsmen that fabricate and install work in various markets in our industry from residential, light commercial, commercial and industrial sites. Members of Local 22 are trained to work with everything from stainless steel for the pharmaceutical industry to fabricating and installing complete HVAC systems to the fabrication and installation of heavy metals, tanks and vessels. Our members and contractors work on new construction projects, renovations and maintenance job sites. We pride ourselves in being trained to work on an HVAC project one day, then be on an industrial site the next, and working on a specialty project with stainless steel or other precious metal. Sheet Metal Workers Local 22 has an accredited Training Facility and is an AWS certified welding facility; our five-year apprenticeship program teaches everything from math, CAD drawing, blueprint reading, fabrication, welding, OSHA 30 and lift training, among many other certifications, along with the on-the-job training that is needed to be a skilled tradesman. 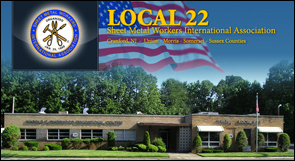 Sheet Metal Workers Local 22 believes in hard work and dedication, which is why we pride ourselves on our PROUD PAST and believe in our BOLD FUTURE.